We bred Katie (CH Blue Heaven's Catherine the Great) and she whelped a litter in January. Katie, as you can see on this website, is a champion and a VN. 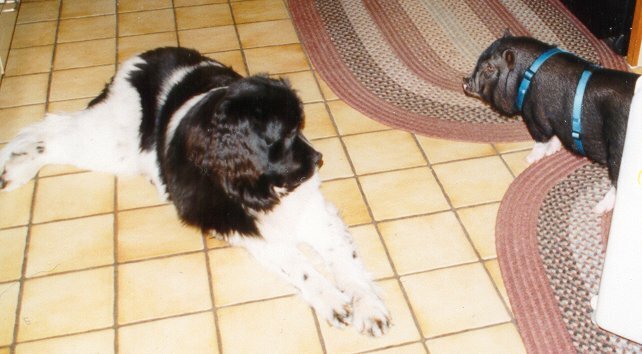 She is a landseer and daughter of Ishtar (CH Blue Heaven's Queen of Heaven, ROM, Select '94 Nationals). She was also number 12 Newf back before she was a champion. 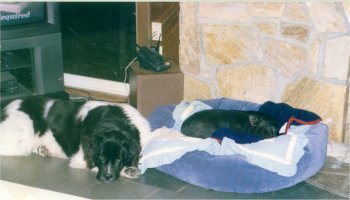 At the time, all top 15 Newfs were champions except for Katie. That was quite special and we were quite proud of her...and still are. We bred her to Packard (Blue Heaven's Twelve Cylinder). Packard is the son of Silky (CH Blue Heaven's Silk Stocking) and Daisy (Blue Heaven's Daisy Daisy CD). He is a black recessive with a large head and massive bone. Packard is now 20 months, weighs about 150 and we expect him to put on another 10-15 pounds as he matures. You will find several pictures of our big pussycat on this website (when you find his picture, be sure to follow the link to more of him). We plan to show him by the time he is two. He has the power and athleticism of both his mother and father. 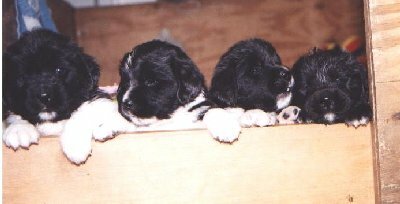 She had 3 black recessive males and 5 landseer females. The puppies were whelped at Cornell Vet School about an hour from our home. Rhoda got stuck in a snow storm at the Best Western near Cornell. She went to some stores, bought blankets, heat lamps and other essentials and set up a MASH unit in the motel. She spent two days there with lots of assistance from the motel crew, who were thrilled to help. When the roads opened up she finally made it home with all puppies and mother Katie in good health. Click here to see some of the new puppies. We have had many champions, titles and awards, but I consider a Katie/Packard puppy born in this January, 2000 litter, who will never be shown, to be one of the greatest successes in my short breeding career. Of course, finding the right owners is more than half the battle. We take as much pride in our owners as we do our pups. In 1997, Katie went to a show in Springfield, MA. Katie was 2 ½ years old. After the show I was approached by a beautiful woman in a wheel chair. Her name was Amanda. She raises Arabian horses, she told me, and so she knows animals. She said that Katie was the most well-structured animal she had ever seen and she would like to have one of her puppies. She wanted a companion and would probably never show the puppy. Early in 2000, some three years later, I called Amanda and told her that Katie had just had a litter of 8. I was going to keep one, but if she still wanted one, I had a nice female for her. She was thrilled. So when the puppy was 12 weeks old, I drove to Rhode Island to deliver the little puppy that was to be called Panda. When we got out of the car there were about 10 people in Amanda’s driveway including Amanda in her wheel chair. Without hesitation, Panda went right up to the wheel chair, sat down next to Amanda, and has not left her side since. Panda has learned to open doors for Amanda, and is going to therapy training classes to learn how to help Amanda even more. She is Amanda’s constant companion, but somehow she knows…knew from that very first moment…that Amanda is her responsibility. Amanda calls to brag about how beautiful and smart Panda is. To know that you have brought a dog like that into the world beats any amount of ribbons one could accumulate. But wait. There is more. Amanda had a pet pig called Watson when she got Panda. They became friends and spent time together. But Watson more or less put up with Panda as opposed to being best buddies. 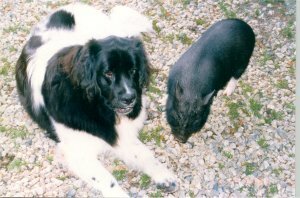 Watson died recently and Amanda got a new pig, Eisenhower, who was one year old, just about the same age as Panda. Panda and Eisenhower have become best of friends. They sleep together, eat together, play together, and are inseparable. And Eisenhower, Amanda swears, is teaching Panda pig language. Pigs have 50 language sounds. Eisenhower puts his head to Panda’s and works very hard to teach Panda “pig”. Eisenhower roots in Panda’s coat constantly, cleaning her of burrs and incidentals. Amanda says she doesn’t get much done because she loves to watch the two of them interact.